Although he came from a family of modest means in rural England, David Hockney made a life for himself that was anything but impoverished. Even at the outset, one senses notes of a “different drummer” beginning to make music. Christopher Simon Sykes covers the years 1937–1975 in David Hockney’s life and artistry. 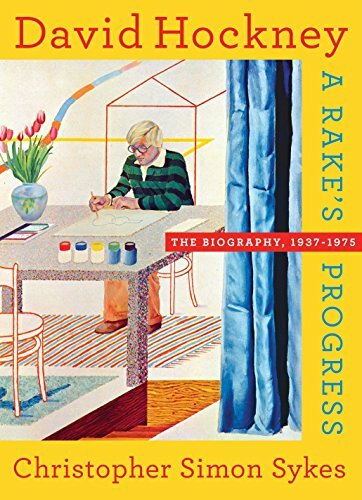 An accomplished writer and social historian, Mr. Sykes captures the essence of David Hockney’s career and personal life in painstaking detail using information from diaries, interviews, archives, notebooks, and artwork. Chapters contain examples of artwork that illustrate the time, location, and liaisons unique to each period. In a highly anecdotal style, Mr. Sykes deftly shows how each of Hockney’s early life experiences helped set the stage for the man he would become. Mr. Sykes tells us that Kenneth, David Hockney’s father, very much a nonconformist in his own way, did not let limited economic means prevent his son from experiencing a world beyond that of Bradford, England. He encouraged creativity, even taking his children to secondhand shops where they became quite creative in their choice of colorful clothing. Saturdays were reserved for field trips—either to the theater, the opera, or on some other educational or entertaining adventure; Sundays remained sacred for worship. Through all this, young Hockney was a sponge, open experiencing it all and making use of everything he learned. David Hockney’s education was due in large part to scholarships due to the family’s limited means. He was guided toward vocational training, of which he wanted no part. Mostly, what mattered to him was art. Even as a small child, he filled margins of newspapers with drawings. In order to appease his counselors, he gravitated toward commercial art and graphics, never intending to pursue work in that field, yet these studies lent him skills that would prepare him to take a place in the contemporary art world. Later, after winning a place at the Royal College of Art, he aligned himself with students who were not merely conforming with tradition, but also “seeing and thinking”—and reflecting the results in their work. These were the rebels whose groundbreaking work helped create the pop art movement of the 1960s. Throughout his student life and his career, he tested the limits, experimenting and embracing failure as much as success. Perhaps because of his peripatetic upbringing, David Hockney allowed himself to take risks with new media and ideas. At one point, unable to afford the cost of paints and other materials, Hockney took up printmaking (where all materials were provided). This enabled him to diversify his portfolio not only in school, but later in his career when he set poems to paper in a series of etchings. Two men figured large in his future as he neared graduation. One was Richard Hamilton, sometimes known as the father of pop art, who visited the RCA and awarded a small prize to David Hockney. The size of the prize was less important than the effect this gesture had on faculty, which could no longer dismiss his work. The second figure was John Kazman, a prominent art dealer, who offered him a contract enabling him to both see the world and produce art—without economic constraints, which lead to prolific output. He became an international success, showing (and selling) his work in England, France, New York, and Los Angeles, where he both lived and worked. The author’s work offers up two assumptions. The first is that the reader knows and understands the art and history of the period with no further explanation. There is little to tell us why David Hockney’s paintings and other artwork caught on. Those in the art world understand; others might benefit from some background as to why his work resonated with the world. The second assumption is that the reader shares Mr. Sykes’ interest in the meticulous anecdotal detail describing Hockney’s navigation through the rarefied world of art, gallery openings, travel, and personal liaisons. He also relates that the death of Pablo Picasso in April 1973 was a terrible blow to David, who “felt the loss of someone deeply respected.” He realized the inevitability of death as a result. This occurred at a time when he encountered himself at a “crossroads . . . trying to break out of something.” Creation of theater sets for “A Rake’s Progress” in June of 1975 launched a whole new era in his life and career. It is here that Mr. Sykes has chosen to end Volume I, teasing us to anticipate the next, showing how this nimble artist retained his place in the tumultuous art world.